It was amusing, well-edited and uplifting — and quickly became one of the most popular current YouTube videos in the world after Spears herself shared it on Twitter three days later. By now, you’ve probably seen the video. As I write this post, it has been viewed more than 2.6 million times in less than two weeks. YouTube statistics show it’s the third-most popular music video on the site this week. Not wanting to miss out on the fun, I reached out through YouTube’s messaging service to the then-anonymous Marine who originally posted the video. His name is Cpl. Andrew Tarin, and he’s a flight equipment technician with Marine Light Attack Helicopter Squadron 467, out of Marine Corps Air Station Cherry Point, N.C. The squadron has flown AH-1W Super Cobra attack helicopters and UH-1N Twin Huey utility helicopters in Afghanistan for the last few months in support of the 26th Marine Expeditionary Unit. Tarin said he and his friend, Cpl. Adam Purdy, decided to lip-sync the song after hearing it on a bus ride from their living quarters at Camp Leatherneck to their job with the squadron. There are 19 performers in the video, all with Marine Medium Tiltrotor Squadron 466 (Reinforced), of MCAS New River, N.C., or HMLA-169, an attack squadron out of Camp Pendleton, Calif. Elements of Tarin’s squadron, HLMA-467, joined VMM-266 (rein.) for the MEU’s deployment. Tarin did all the filming and editing for the video, with Purdy, a Cobra and Huey airframe mechanic, helping to select clips appropriate for different pieces of the song. 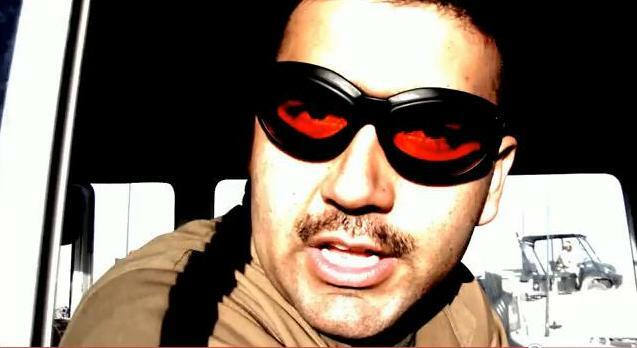 Tarin appears in the video himself at the 3:10 mark, wearing red goggles and a mustache while singing and sitting behind the wheel of a small bus. Great vid. There’s gonna be the “that’s not professional, they should be ashamed” blah blah people, but it’s awesome. Keep your spirits high out there. I saw this on Fark.com about a week ago and couldn’t stop laughing. I love it, and I’m glad these guys got enough downtime to make their claim to internet memedom. Keep up the morale! Looks like it missed the last part. Leatherneck can see fit to get in a little fun while enduring some terrible conditions. God Bless each and every one of you! I think you all did a great job, its not easy not to loose your mind while visiting the sandbox. I hope theres more to come and you all stay safe! Semper Fi!!!!! Pingback: Battle Rattle - A Marine Corps Times Blog – Deployed 3/2 Marine asks Mila Kunis: Will you go the Marine Corps ball with me? This was a great video… I really enjoyed this one hehehe.. Thanks for your posting. My partner and i have generally seen that a lot of people are desirous to lose weight simply because wish to look slim and attractive. On the other hand, they do not often realize that there are more benefits for you to losing weight in addition. Doctors insist that fat people experience a variety of conditions that can be directly attributed to their particular excess weight. The great news is that people who sadly are overweight and also suffering from diverse diseases are able to reduce the severity of their particular illnesses through losing weight. It is possible to see a gradual but noted improvement in health while even a minor amount of weight reduction is attained. One thing I’d really like to reply to is that weight loss program fast can be achieved by the proper diet and exercise. Ones size not just affects appearance, but also the complete quality of life. Self-esteem, major depression, health risks, as well as physical abilities are impacted in an increase in weight. It is possible to make everything right and at the same time having a gain. If this happens, a medical problem may be the culprit. While a lot of food and not enough exercise are usually accountable, common health concerns and widespread prescriptions could greatly enhance size. Thanks a bunch for your post here. I figured out more new things on this weight reduction issue. A single issue is that good nutrition is highly vital if dieting. A tremendous reduction in junk food, sugary foodstuff, fried foods, sweet foods, beef, and bright flour products can be necessary. Holding wastes organisms, and toxic compounds may prevent goals for losing fat. While specific drugs momentarily solve the matter, the awful side effects aren’t worth it, and in addition they never offer you more than a non permanent solution. It is a known fact that 95% of dietary fads fail. Many thanks sharing your ideas on this web site. Thanks for the recommendations shared on your blog. Something else I would like to say is that fat reduction is not all about going on a dietary fad and trying to reduce as much weight as possible in a couple of days. The most effective way to lose weight naturally is by getting it slowly and obeying some basic suggestions which can provide help to make the most from your attempt to shed weight. You may realize and already be following a few of these tips, however reinforcing know-how never damages. I believe that avoiding highly processed foods would be the first step to be able to lose weight. They will taste very good, but processed foods have very little vitamins and minerals, making you try to eat more only to have enough strength to get with the day. Should you be constantly having these foods, switching to whole grain products and other complex carbohydrates will let you have more electricity while eating less. Interesting blog post. my three year-old son and i canNOT get enough of this video. we could watch it all day. the way my little guy asks to watch it is he mimics the two fellas on the hill, with their arms in the air, moving their hips! besides the glorious spirit contained within, the artistry of the video – the colors, shots, etc. – is brilliant. you rein marines rock. whoah this weblog is magnificent i like reading your posts. Keep up the good work! You realize, a lot of people are hunting around for this information, you can help them greatly. I will right away clutch your rss feed as I can’t in finding your e-mail subscription link or e-newsletter service. Do you’ve any? Kindly permit me know in order that I could subscribe. Thanks.